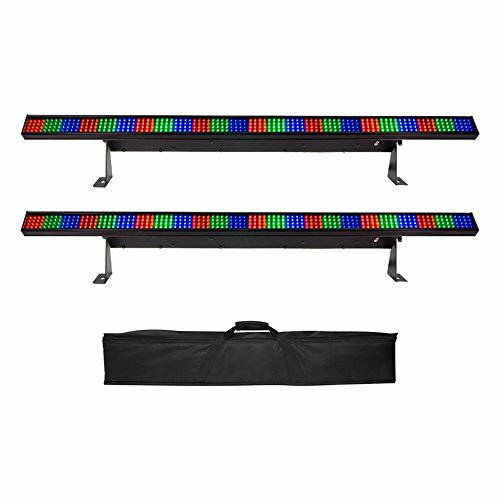 Your event is about to get a dose of vibrant colors with these 2 Chauvet DJ COLORstrip DMX LED Light Bar Fixtures to carry from gig to gig with the included soft case carry bag. The COLORstrip is a full-size, linear wash light bar to light up the night and provide your crowd or audience with mind-blowing light effects. It can be controlled through 4 DMX channels, multiple modes, or the control panel. It shows off built-in programs with automatic and sound-active triggers and allows access to preset RGB colors including yellow, purple, cyan, and white. Entertain with flash, color chase, sequential color chase, color mixing, and color fade patterns. The included versatile and practical soft case bag protects your LED strip fixture with an internal divider that separates it into 2 padded compartments for enhanced protection during transport. It has a convenient handle and shoulder strap and access to each fixture quickly and easily saves time setting up and tearing down your equipment.